Beautiful dreams, I dream of unicorns in my head, just before I go to bed. These unicorns are bright, just want to say, “little one, have a good night” “little one, I want to keep you warm.” I want to make sure your blanket is not worn, and I am so glad you are born. You are an unexpected blessing, I never knew I was getting. I wouldn’t change a thing for all the joy you bring. It is all the little things you do, that make me love you. Your beautiful face, your wonderful ideas, of the way the world should be. Climbing trees is your favorite thing to do. Fixing your scraped up knees, with a Band-Aid and a little kiss. Always being there to protect you, that is what I wish. I wish I could do, and nobody would hurt you. Dream deep my little one, and go to sleep, and you will learn your life is very unique. You are special, in your own way; that is what everybody has got to say. This is something I hope for you, this is something I hope you can do. Be wise and help open people’s eyes, to all the challenges in your life. Help them understand what your life is, and what your life could be. We are all the same, you and me. 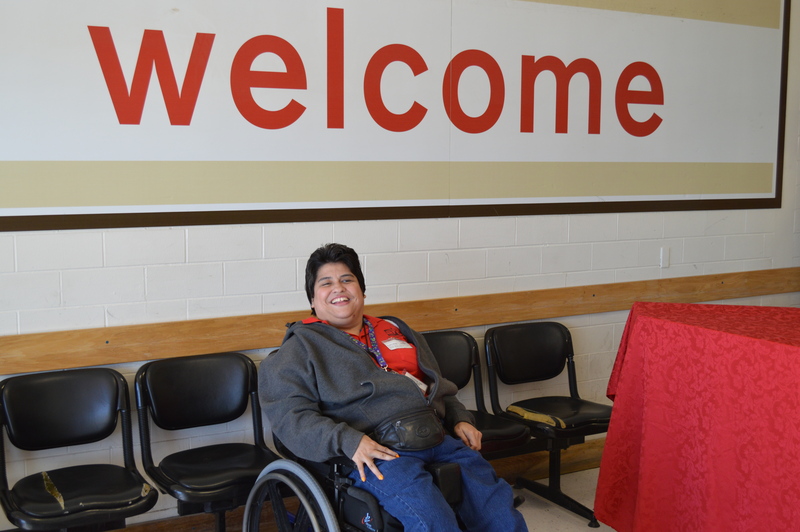 If you have been to our JCRS store, you will recognize our very talented arc ambassador, Lorraine Espinoza, who has brought beauty to our lives since she began working as a store greeter in 2007. Lorraine continues to spread beauty in our lives with her poetry and whether it be through her poems, or at work, this woman will warm your heart, and bring a smile to your face. Lorraine’s poem “I Love Being a Kid” brings about summer memories with gentle fathers and the memories they create. I Love Being a Kid! I love pie a-la-mode, but I am not very old. I am only a year; I can’t even crawl near, where the pie is. It looks yummy to me, I want a big piece and I really don’t know what to do, because I can’t chew. So, I am going to try to smash it, on my face. Hopefully someone will bring a fork, because they notice I might need help. No matter what I do, people think I am cute, especially when my dad is in his gray sports suit. He wants to pick me up, all the time, but he never wants to get dirty. When you have babies, you are bound to get dirty. My dad is my favorite man. He loves everything I do, and my name is Ruby Blue. I was named after my dad’s two favorite aunts. Never got to meet them, but they are both inside you. The things you do remind me of them. You will grow to be a wise woman, with a very busy future. I will be there, to help you, because I am your dad, and you are my little girl. You are the apple of dad’s eye, so I never want to see you cry.